Stainless steel case with a stainless steel bracelet. Fixedstainless steel set with 80 diamonds bezel. Mother of pearl dial with silver-tone hands and alternating Roman numeral and index hour markers. Minute markers around the outer rim. Dial Type : Analog. Luminescent hands and markers. Seconds sub-dial above the 6 o’clock position. Quartz movement. Scratch resistant mineral crystal. Solid case back. Case diameter : 37 mm. Round case shape. Band width : 18 mm. Band length : 6 inches. Deployment clasp. Water resistant at 30 meters / 100 feet. Functions : hour, minute, second. 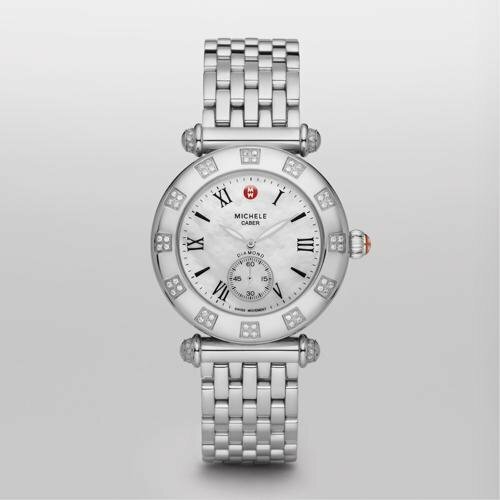 Additional Info : the stainless steel bracelet is interchangeable with any 18mm michele strap. Dress watch style. 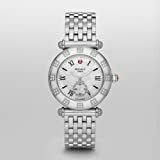 Michele Caber Atlas Diamond Bezel Ladies Watch MWW16A000048.